This post will share a recipe for a beautiful, fast preserve that is perfect for use in a steam canner which maximizes it’s time-saving benefits and is also well suited for a water bath canner too! Read on for a savory, quick preserve. Pickled pearl onions are an ideal recipe for steam canning, so I’ll include instructions for both steam canners and water bath canners. They are delicious on poached eggs, in salads, as part of an hors-d’oeuvres plate, and in a cocktail like a Bloody Mary. They are my favorite on poached eggs on toast with cheese, avocado, tomato, bacon…try it. You won’t be sorry. If you are new to steam canning but the idea is intriguing, watch this video here to help you get started! Get the steam canning mini resource guide to help you understand the benefits of steam canning versus water bath canning! Bring a large pot of water to boil up to 24 hours before you plan to can these onions as they need to bring in a saltwater bath for several hours before canning. I’ve gotten away with as few as six hours soak-time. Put 2 ½ pounds of pearl onions (white or red) in boiling water for 2 minutes. Strain and pour into an ice water bath to cool. When cool to the touch, slice off the root end of the onion, about a quarter of an inch, and squeeze from the opposite end to the external layer remains in your fingers and the skin-free pearl onion squirts out. Reassemble the onion if the layers separate. Put the skinned onion in a bath of cold salt water- 4 cups cold water with ½ cup salt. Let the onions rest for several hours. Water bath canners: Starting 30 minutes before you plan to make the brine, fill water bath processing pot with water and jars (about 6 wide mouth half-pints) and bring to a boil. Assemble jars, new lids, and rings on a towel covered countertop with a funnel and jar lifter nearby. Bring a saucepan filled with new lids and rings to a simmer and have lid lifter handy. Proceed to the Prepare the Brine step below when the water has come to a boil. Steam canners: Add the required 2 ½ quarts water to the steam canner and turn on to medium-high. Assemble jars, new lids, and rings on a towel covered countertop with a funnel. 1 ½ cups white wine vinegar, 5% acidity, which I prefer for its mild flavor which really lets the spring flavor of the onions shine, but you can use any vinegar as long as it is 5% acid. Add drained, peeled onions and bring to a boil and gently stir. Fill jars with funnel each jar one time, leaving ¼ inch headspace, aiming for the jar to be full of onions that are submerged in brine. Put on new lids and rings and tighten just as tight as you’d tighten a bathroom faucet. Steam canners: Place the jars on the rack about a quarter inch apart. Put the lid on the steam canner with the vent facing away from you but where you’ll be able to see the column of steam pouring from it. Turn the head up to high and monitor as the dial on the thermometer moves to the green or starting mark for your elevation. Adjust temperature as needed to prevent the steam canner from boiling too vigorously; medium-high is probably just right. Start the 10 minute processing time when there’s a column of steam pouring from the vent that’s about 6-8 inches and the dial indicates you are in the green/go zone. Remember to adjust for elevation by adding 5 minutes of processing time for every 1000 feet of elevation you are canning above sea level. When the time is up, you can let the lid remain on the pot indefinitely. When it has cooled significantly, the teakettle-type whistling has stopped, use hot pads to lift the lid open AWAY FROM YOU so the steam pours out the back of the pot away from you. Set lid aside and either wait till the jars are cool to the touch to place on the towel covered countertop or use a jar lifter to move them to the counter. Water bath canners: Use the jar lifter to put one jar back into the water bath process pot at a time. Bring the water back up to boil, and set the timer for 10 minutes, adding 5 minutes for every 1000 feet of elevation you are canning above sea level. When the time is up, remove each jar carefully using the jar lifter to the towel covered countertop. ALL: Label cooled jars and store. Note: If you used red pearl onions in this recipe you’ll be happy to see that your product is a beautiful shade of pink. Store this in a cupboard out of light to help that color hold but know that it fades over time. The white onions stay a pretty white. 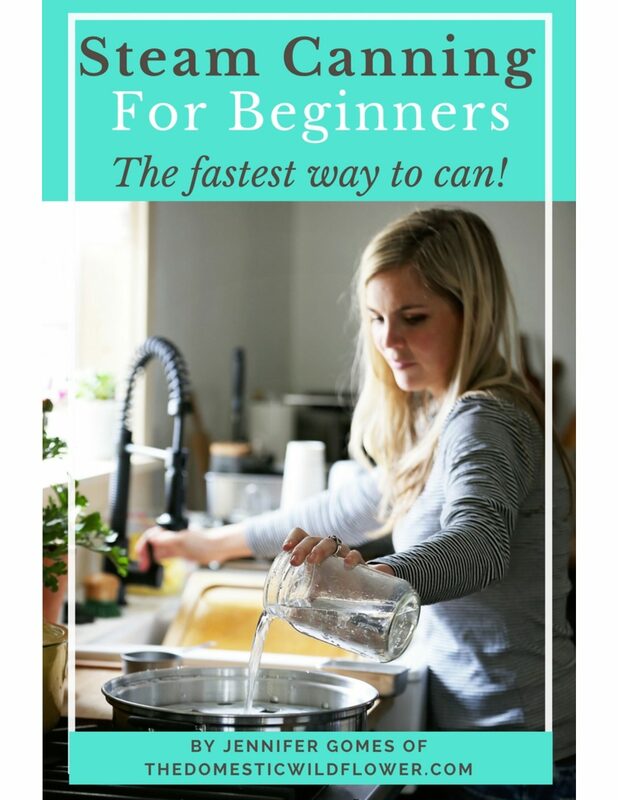 Wildflowers, I’m so thrilled to share with you my new video workshop that will show you exactly how to use the steam canner to prepare healthy, home-cooked foods FAST. Canning is cooking in advance, and STEAM CANNING is the fastest way to do that. And you’ll be able to have these delicious foods prepared exactly as you’d like- with no worries about allergens, additives, processed junk, or dangerous chemicals. Do you think this would work with only pearl onions? What about slices of ‘normal’ onions? Not sure if the ph is different in different types. I’m not sure because the processing time is determined by the density of the food- the inside of the onion has to get over 212 and if it’s a lot bigger than a pearl onion I don’t feel confident saying it’s 100% safe. A big onion is a lot bigger than a pearl onion, you know?